In this post of Homeo Expert, we shall discuss the best Homeopathic Medicine for Hiatus Hernia or Homeopathic remedies for Hiatus or Hiatal Hernia. Hiatus hernia occurs when the upper part of the stomach pushes through the chest through a hole in the diaphragm. The diaphragm has a small opening which is known as hiatus and esophagus passes through it to attach with stomach. 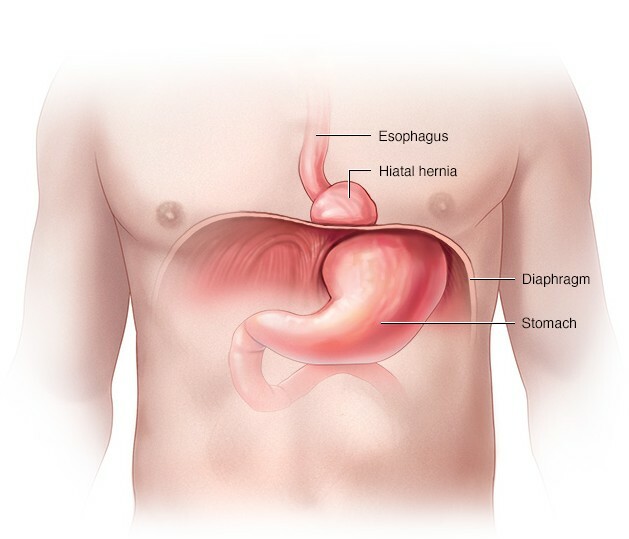 Hiatus hernia occurs when the part of the stomach slips up into the chest by the hole of esophageal hiatus. Robinia and Natrum Phos are wonderful homeopathic remedies for hiatus hernia when it accompanies acrid and sour belching. There are several symptoms of Robinia including sour belching or vomiting, heartburn and acidity which becomes worse when lying down at night. There are also symptoms of stomache along with burning sensation in the stomach at night and distended abdomen is also felt by the patient. Natrum Phos consists of the symptoms of waterbrash, sour belching, heartburn and sour vomiting during the morning. The patient also feels pressure and heaviness in epigastrium and spitting of food in mouthfuls can also occur in these cases. Carbo Veg is another useful homeopathic medicine for hiatus hernia when it occurs with gastric complaints. In addition, this remedy is also helpful in cases where the patient feels difficulty in breathing with gastric symptoms. In Carbo Veg, the patient also encounters waterbrash, sour belching and difficulty in breathing and belching occurs after drinking and eating anything. When the patient eats the simplest kind of food even it causes sour belching. The patient also feels as his stomach is full. In addition, the patient also feels a contractive pain in the chest along with full and bloated abdomen. Abies Nigra is an excellent homeopathic medicine for hiatus hernia to manage it. The patient of this medicine feels a sensation of a lump or something hard present in the esophagus or cardiac end of the stomach. In addition, the patient also feels that there is a food present in the epigastrium. The patient also feels waterbrash with a choked feeling in the throat and he may also feel stomache after eating. He also feels tightness in the pit of the stomach. Lycopodium, Nux Vomica and Pulsatilla are important homeopathic medicines in the homeopathic treatment for hiatus hernia. They are excellent homeopathic remedies for hiatus hernia when it comes to the complaints of gastric problems. Lycopodium is a helpful homeopathic remedy for dyspepsia and heartburn that becomes worse after eating food like(starch) cabbage and beans. Pulsatilla is also helpful when the problems become worse after having fatty food. After eating greasy and fatty food, the patient feels tightness in the stomach with heartburn. In addition, Nux Vomica is another suitable homeopathic remedy for gastric problems including waterbrash, heartburn, sour and bitter risings, vomiting and nausea after having spicy food, coffee and alcoholic drinks. Reduce the meal to 3/4th of the stomach. I am suffering from small hiatus hernia and grade A esophagitis with severe pain in esophagus. I had taken Allopathy but later on switched to homeo. It is four months the bloating has reduced but there is still acid reflux and severe pain in esophagus. Kindly advice if homeo can cure the hiatus hernia and Gerd and how long does it take for homeo medicines to cure the problem entirely. Treatment is not free of cost.